on a conference table than comparable mics and because of its highly directional pickup pattern, the PCC-130SW minimizes background noise and feedback. The microphone uses the principle of phase coherency achieved by mounting a small-diameter mic capsule very near a boundary. Direct and reflected sound waves arrive at the mic in-phase, and add coherently. This enhances sensitivity, clarity and reach. Self-contained electronics eliminate the need for an in-line power module. Powered by 12-48V phantom power, the PCC-130SW has a low-impedance balanced output which permits long cable runs without hum pickup or high-frequency loss. This inconspicuous boundary mic also features a silent-operating membrane switch that is normally off. This switch can be configured for touch on/off, momentary on or momentary off. A high-intensity LED lights when the unit is on. 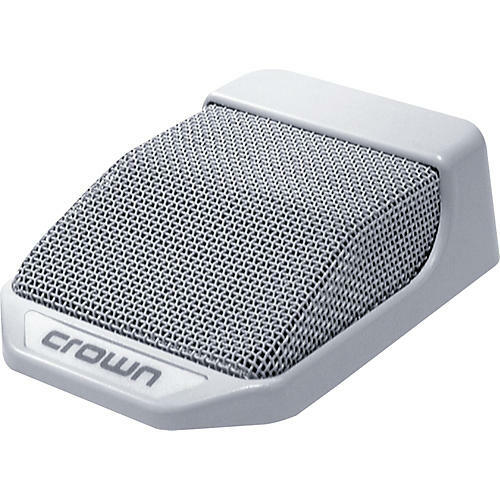 The 130SW is intended for multiple-microphone use on a conference table where each person wants control of his or her microphone. The microphone attenuates 70 dB when the switch is in the off position. Capable of withstanding up to 120 dB SPL without distortion, the PCC-130SW will never overload in practical use. Its electret-condenser capsule provides a wide, smooth frequency response from 50 Hz to 20 kHz. RFI suppression is included. Self-noise is low and sensitivity is very high. A bass-tilt switch allows the user to tailor the low-end response for particular applications. Included with each PCC-130SW is a 15-foot (4.6-m), two-conductor shielded microphone able with a TA3F connector (mic end) and 3-pin male XLR-type connector (output).